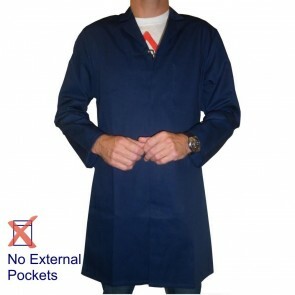 Our food trade coats are manufactured specifically for food production areas where external coat pockets are banned. 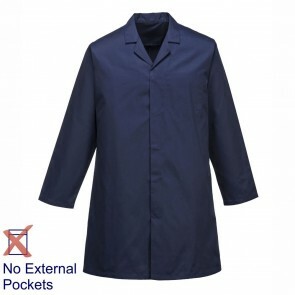 Our men's food trade coats are equally suitable for ladies who prefer a straight cut coat. 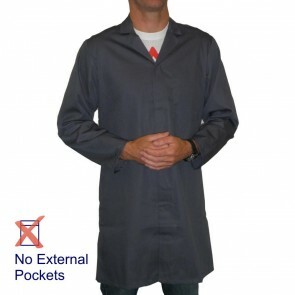 The ladies version of the coat is slightly more shaped. 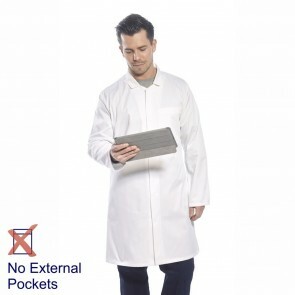 With a large range of sizes these white coats and coloured food trade coats are produced especially for food establishments. 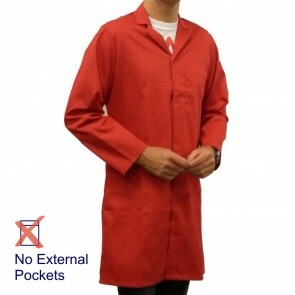 They have been made without any external pockets so eliminating the risk of loose or unhygienic items finding their way into food preparation areas. 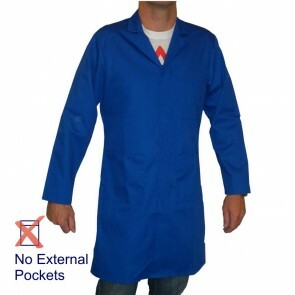 This makes them ideal for use in food factories, butchers shops, catering establishments and laboratories. 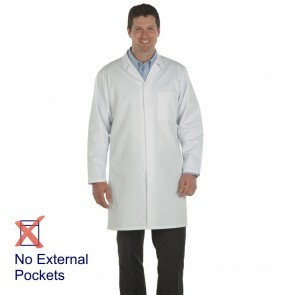 Our food trade coats are made from quality 245gm (7.25oz) polyester cotton (polycotton). 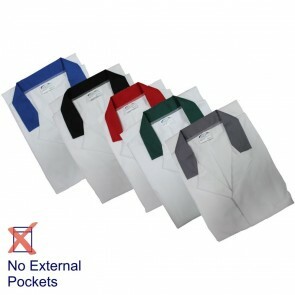 Although there are no external pockets, there is an internal breast pocket. Fastening is by means of concealed front studs. 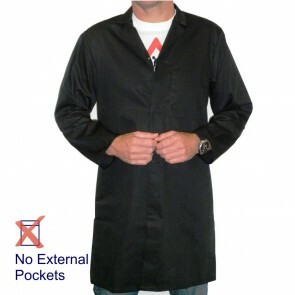 The back of the coat has a central vent. 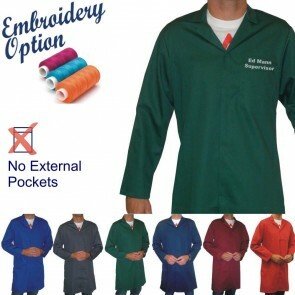 We can also offer an embroidery option with this garment. Our Text Embroidery service includes up to two lines of text in a range of colours and font types. 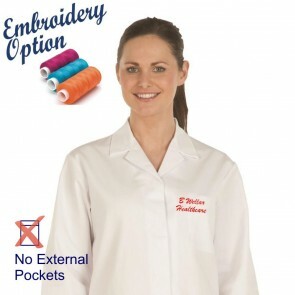 Embroidery text can include the name of the organisation, member of staff, department or job title. 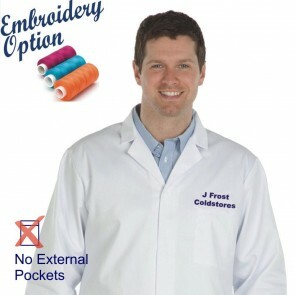 We are also offer a Logo Embroidery service subject to an initial set up charge. The cost of set up will vary according to the intricacy of the logo and the number of stitches required to produce it. If you need a different coloured coat, something more lightweight, alternative fastenings, etc.., we can also produce Custom Coats to order. 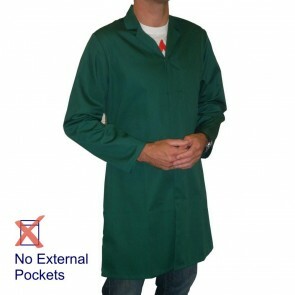 For more details, please see our Bespoke Clothing pages.